Now running, he had never seen the campus cops get aggressive before. Something clicked– he could now see how it could happen, how it was happening to him– he was questioning, even doubting, those he had looked up to, learned from. Now he was told to just obey and he didn’t like it. What had actually happened was pretty tame from what he was reading in the papers of what was going on other places, but it was something about coming to his campus. In the morning, his friends in the dorm had convinced him to help prepare for the anti-war protest in the afternoon. This meant that he would have to skip work at the campus hotel, call in sick or something, which was a transgression he was not comfortable with. He was happy with his studies, learning a lot and at high speed, but letting his boss down at the hotel, and having to lie was outside a Mainer’s comfort zone. But he let his friends win out, making signs, listening to the new music, was more exciting than setting up people’s rooms in the hotel. Hendrix was his favorite—there was something raw and burning that brought it all home to him even though he was in a nice green isolated campus in Vermont on a spring day. He had read the New York Times in the morning, but he was finding the mimeographed underground fliers more riveting, but more importantly, more true. But “true” might be overstating it–they reported events going on at other campuses in very different ways. What was true was starting to be a bit hard to figure out. The debates on perspectives and underrepresented voices were always understandable but, frankly, a bit abstract compared to sitting down and having to reconcile these different newspapers when he did not have a god’s eye of history to say, “oh, yes, I knew it all along, it really happened this way.” He was just confused. He knew they were not winning the war, but what about the kids at the University of Wisconsin– did the cops really let loose on them for doing, well nothing much? Or was it actually as insignificant as the small piece implied in the New York Times saying some activists were stirring trouble? It was these small issues that helped him the most in understanding from the confusion, by being confused, about what is right or wrong; what is true or exaggerated; how this generation could come to question the fabric that had coddled them. So he brought his copy of Electric Ladyland that could now legitimately be taken out of the library since last week. He loved his turntable in the dorm living room, where he could turn it up, maybe a bit too loud. He was the self-appointed music aficionado in his dorm and got to know the music librarian pretty well. The collection was pretty good too, he tried to keep himself to the new-releases display and took to reading Rolling Stone and getting into waiting for things to be put out, usually on Thursdays. It was then that he could take them home and listen there. It was much more satisfying to crank it on the hi-fi than sitting in a little carrel with headphones on. He liked the suspense of waiting for the new releases. 1968 was a good year for music, he thought, and it was bringing together his love of music with the politics and issues that he was waking up to. His program on the campus radio station had gathered more listeners throughout the year, and he was given the best slot, after dinner, because he would play music but also talk about happenings at other campuses that most did not know about. A little bit of context never hurt anyone and if he kept it short, got back to the music, people seemed to even like his historical banter. Some of his friends really got into the movies, putting on nightly shows once they got the hang of the projectors. It was a bit hit-or-miss since they often had not even seen the movie before they put it on for other students. But it all worked out. They rarely got to see TV, but they had gathered in the library around the small set last week to see the reporting of Democratic National Convention in Chicago. A police riot is what the underground sheets were saying, but the Chicago Tribute was saying it was provocateurs, and maybe foreign ones, that were disturbing the peace and not respecting the democratic process. “Uh, where did you get the paints and cardboard, Ava?” and now her smart aleck smile returned. “Oh, the Art teacher is an artist herself so she understands if some of the supplies disappear, and besides I think she might be coming to the protest– she is into it.” Bryce looked a bit puzzled, and asked, “are the teachers allowed to come to a protest and one that we have not cleared with the administration?” “Allowed?” Ava pondered, “hadn’t thought of it, yes, I guess she could get in trouble.” Bryce’s expression of “well, yeah” and a bit of fear communicated better to Ava what was at stake. They were breaking rules, skipping work, stealing supplies. In some measure being caught up in the moment, in another measure it was wrestling with the issues inside– they had nothing against the college and certainly didn’t want to get their Art teacher in trouble. “Are you doubting this, Moon Child?” Bryce looked down and tried to think of what he wanted on his sign. But looking over towards the administration building there was a row of men in blue in formation and looking… dangerous, with billy clubs across their backs. Bryce and Ava wondered if there were that many cops on campus and they looked closely at the faces. Bryce said: “That is my boss, Mr. Stills, from the Hotel, what is he doing here?” Bryce walked towards him, but there was no eye engagement at all. Bryce could not figure out the look in his face– was Mr. Stills happy about being there, or a bit afraid of being there? The student president started off his speech with a ponderous argument against the war, but was drowned out pretty fast with chants of “hell no, we won’t go” and people rushing the stage. He could not even finish his speech and was taken over by a disorganized sequence of Buddhist chants, tirades about mistreatment of American Indians, and even a Dylan lookalike trying to get everyone to sing together. And this is when the shouting started. The microphone went dead. The students were now a mob with different people calling out directions. “On to the administration building!” and the row of campus cops, in unison, came to attention. Bryce did not like where this was going, but was feeling the crush of students goading themselves on towards the cops. And Bryce and Ava ran. They ran out of the Quad and the day snapped back into a beautiful spring day, but they were shaken. They did not know what to do or where to go, so they went to the library, where Bryce always felt safe. Bryce and Ava had now caught their breaths, helped by someone to pull them out of the intensity in the Quad to put it in some perspective. Carol went on, “Your class is asking the right questions, though, and really staying in the moment– this is not easy for everyone to do. 1968 was very intense even on small college campuses. Compressing 1968 down to one month is a headspin that is difficult to take. Assassinations, the draft, Saigon… Sometimes I wish we could spend a full year in 1968– there is so much and so many perspectives. Think about villagers in Vietnam, student riots in Paris, and later, as the song says ‘4 dead in O-hi-o’”. “I just hope no one gets hurt out there,” Carol mumbled under her breath. Bryce and Ava had another month in the 1960s to go. Bryce was looking forward to Led Zeppelin’s first album. Ava was thinking of applying for a job as an assistant Art teacher so she could stay– she liked art nouveau– so maybe in Kronos 20, but was not sure. Right now, 1968 was causing their heads to spin. Causing them to Grow. 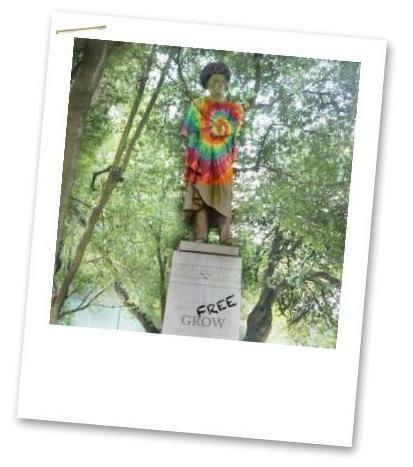 Grow Free.